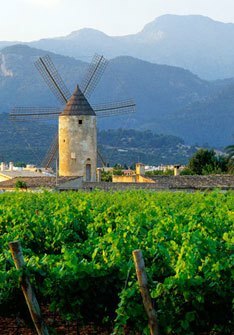 Organic red wine from Mallorca, varietal Merlot aged for 12 months in French oak barrels. Organic white wine from Binissalem-Mallorca made from native grape Premsal Blanc. Red wine from Majorca made from a blend of 5 varieties aged for 6 months in French oak. Red wine from Majorca aged for 10 months in French and Central European oak barrels. Organic red wine from Mallorca. Blend aged for 12 months in American oak barrels.